The Bar Association of Sri Lanka (BASL) today said that it had given two weeks to Attorney-at-Law Sugandhika Fernando to produce the evidence to prove her allegations against the Judiciary. 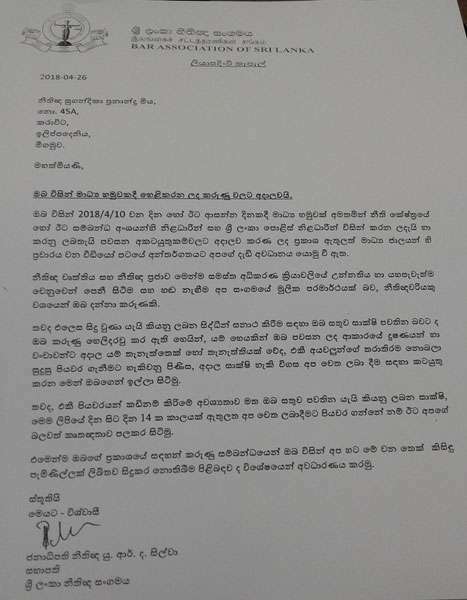 BASL Chairman U. R. de Silva PC said BASL’s attention was directed to a statement made by Ms. Fernando last month, where she referred to the injustice caused by some officials of the Judiciary and the Police. He said, though she had made such a remark, she had not complained to the BASL about such incidents. Mr. de Silva said the BASL had written to Ms Fernando on April 26, informing her it would take necessary legal action against the wrongdoers irrespective of their positions, if Ms. Fernando could provide evidence to support her claims. We do not say that any of the officers are perfect. But criticizing everyone at random can lead to a collapse in the jurisdiction and the rule of law,” he said. She is a brave woman and we should appreciate her. But I have a doubt on the timing. Is she carrying out a project of a LieTTE backed NGO to discredit out judges so that the International perpetrators will have ammunitions to support their case to provide International Judges for the so called accountability issue during the last phase of the humanitarian operation. We have to investigate closely who she was associating while overseas. Hiranthe, Lady should be congratulated for the honest and exposing our corrupt justice system. Its the justice system that create countries misery for all SL’s and minorities use this flow to highlight country as a racist and violent. Justice system evolved from colonial past and at present it cater for the corrupt elite and we need to re write the whole constitution to create balance and fair system based on our values. We also need to remove, Kandian, low country, Northern, and muslim based law’s that enacted from colonial past and these laws have no place to todays governance. Suganthika is right. The parliament,BASL,Judiciary, police have to be cleansed for this country to progress. It is interesting that Ranil, President and the cabinet are silent. She is a brave woman should be protected from the judiciary who is not for purpose..
She is a brave woman should be protected from the judiciary who is not fit for purpose..